Nathan Lee Ramsey was born July 12, 1941 in Neptune. A strapping six-footer with great speed and anticipation, Nate was a standout for Neptune High in basketball and football, earning a gridiron scholarship to Indian University in the late 1950s. He arrived at IU just as a scandal exploded over cash payments to players. The team was sanctioned by the NCAA, and none of its wins in 1960 (Nate’s first varsity season) were counted. Nate wore #44 for the Hoosiers and played half back on offense and cornerback on defense. Between 1960 and 1962, he distinguished himself as one of the best pure pass-coverage men the Big Ten had ever seen. Nate finished with over 1,000 yards from scrimmage on 169 rushes and 18 receptions. 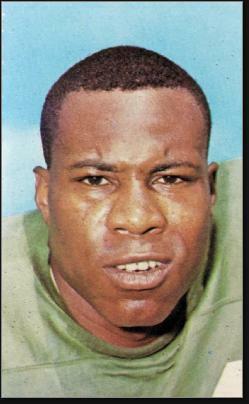 In 1963, Nate was drafted in the 14th round by the Philadelphia Eagles. He won a starting job in 1964, teaming with fellow corner Irv Cross, and picked off 5 passes. The Eagles were not a strong club during Nate’s years in Philly, but he distinguished himself as a solid, consistent defender. He moved to safety in 1965 and added 6 more interceptions—three in one game against the Cardinals. In a game against the Steelers that same year, Philly set a record with 9 interceptions. Nate had one, plus a fumble recovery. He later was named the team’s defensive captain. Near the end of the 1970 season, on December 14, Nate was standing on a street corner in West Philadelphia when a gunman fired three shots at him. Nate took a bullet to the chest but survived to play in 1971. He recovered 5 fumbles that year. The 1972 season was Nate’s last with the Eagles. In 1973, he was critical of the team’s new defense and was cut during training camp. He caught on with the Saints for one last year. The WFL Portland Storm showed interest in Nate in 1974, but he decided to retire at age 33.